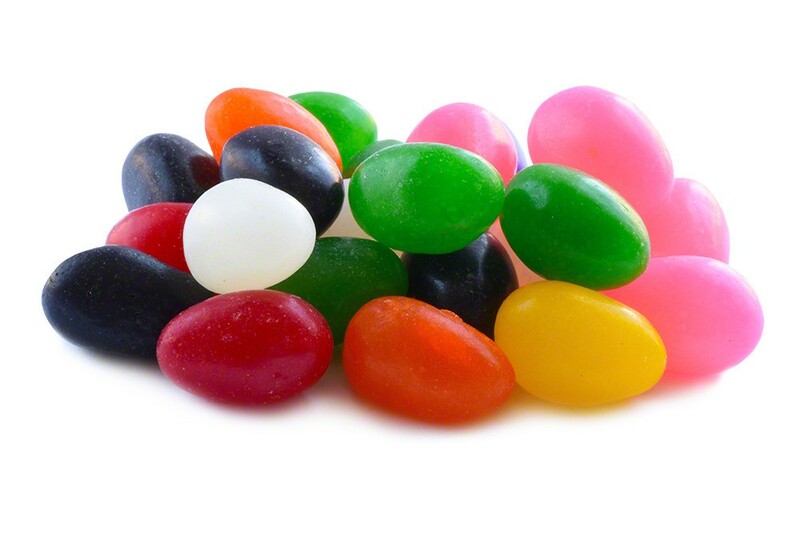 Brighten up your kitchen counter or desk with a jar of colorful jelly beans. Enjoy the simple pleasure of having a tasty, fun treat within easy reach at all times. Tuck a few of these nostalgic gems in a lunch bag or backpack to enjoy as a quick pick-me-up. Jelly beans are definitely not an age-specific indulgence. Sugar, Corn Syrup, Cornstarch, Modified Cornstarch, Maltodextrin, FD&C Red 40, Yellow 6, Yellow 5, Titanium Dioxide (for color), Blue 1, Red 3, Natural and Artificial Flavors, Carnauba Wax, Beeswax, Confectioner’s Glaze Packaged in the same facility as peanuts, tree nuts, soy, and milk products. I enjoyed the jelly beans too much. I ate them all. No discipline needed! These were very good. Took me back to my childhood! The product was shipped promptly and as described. Just wanted to make sure I reviewed both bags separately. The only suggestion I have is to maybe try marketing flavor specific. Black is my favorite but red would do also. Jelly Beans #(10803)Celebrating the risen Christ (Easter), just wouldn’t be the same without some quality jelly beans for the Easter bunny to fill the baskets with:). And, once everyone gets a taste of their easter basket. The second bag wont last long. Looking forward to future promotions. Order#(9672/9673I wanted to order some candy to see if they lived up to the high quality product and service. I will have to be careful with my sweet tooth on these babies. All the high quality of the peanuts with a low cost. I’ll be back for these!